Vegetable Soup (with frozen vegetables) – Create, Make & Bake! I didn’t know if we would like this at first so I made half the amount, but everyone liked it…. typical I know but it is actually surprisingly nice and I now regret not making the full amount. (This is the halved amount). We got 4 bowls of soup from this quantity. Quick and easy to prepare for a healthy starter or a light lunch. 1. Heat the oil in a large pan, add the onion, garlic, celery, and carrot. Stir until all the veggies are going soft. In a different different pan boil some water in a pan and add the frozen veg boil for about 3 minutes. 2. Drain the veg and add to the onion mix, along with the salt, thyme and oregano. Stir for a further few minutes. 3. After a few minutes of stirring, add the bay leaf, water, and stock cubes. Stir then add the tomato, and salt & pepper. Turn the heat up and let it boil for about 10 minutes. Take out the bay leaf and get rid. 4. 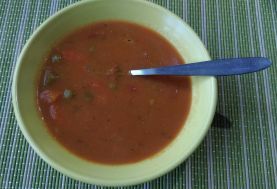 If you want a slightly thicker soup, blend about a third of it and then stir it back into the rest. Done.